Commercial oven cleaner is one of the most toxic cleaning products that you can use. Some can contain lye and ammonia which actually eat your skin (I guess that’s how it eats the residue off your oven, too). 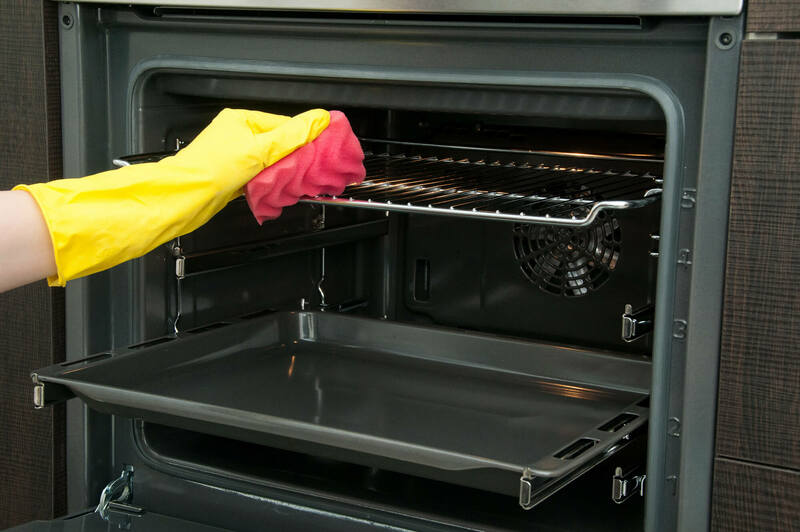 The fumes not only get into your lungs and linger in your home, but they stay in your oven once it is “cleaned” and the chemical residues intensify as you bake them into your food. And then there’s the waste that enters the environment with disposal. These toxic ingredients are absolutely unnecessary. You can protect yourself, and your family, by making a simple, inexpensive, cruelty-free cleaning paste at home—using natural soap, vinegar, baking soda and if you want, essential oil for a nice fragrance. Chemicals or not, this is still a job that takes a bit of effort. What you coat the oven with, you will have to wipe out, and that isn’t a walk in the park for some folks. For me, I was amazed how easily the grime wiped off—barely any scrubbing at all. It was fun to watch the unveiling of the clean oven with each wipe. But for those of you who despise cleaning, put a few drops of organic lavender essential oil into your cleaning mixture to calm and relax you as you work. Put on your favorite tunes and envision your oven just like new again. In no time, there it will be, all shiny, glossy and debris-free. * If using store-bought soap instead of soap nuts liquid, use 1 tbsp soap. Remove your racks from the oven and clean them separately in the sink. Pour your soap and other ingredients into a glass bowl and mix well. Paint your paste over the entire surface of your oven. Let it sit for 6-8 hours (overnight works well) and be amazed at how it foams up slightly, just like the creepy chemical kind. You can actually see the grime being lifted off of the oven surface. Fill a bowl with clean water. Dip your scrubber, wipe and repeat until the oven is as good as new. You may have to change your water bowl a few times, but you can feel good knowing that you aren’t dumping toxic chemicals down the drain.